As a careful reading of my tweets will show, the allegations are relayed, not mine, though the Bharat Swabhiman’s hesitation to launch an all-out movement against government’s corruption was witnessed firsthand. For want of space on Twitter, I couldn’t name the persons making the allegations. The friend referred to there is Chandra Vikash, who was once my batchmate in Holy Cross School, Bokaro Steel City (then in Bihar, now in Jharkhand), between the grades VI and X [We cleared Class X in the year 1987]. Disturbed as much as I was by rampant, all-pervading corruption, Vikash had moved to Delhi, leaving his well-paid job as an engineering consultant in Bangalore because he thought the national capital was the epicentre of corruption and here was where he could make the greatest impact by being a part of the anti-corruption ‘crusade’. It was through his reference that I met with Suresh Chugh, associated with Arya Samaj Mandir, Rajendra Nagar, Delhi, now involved in setting up gurukuls across the country. He is the former Intelligence Bureau officer referred to in my tweets and a former member of BS. The whole of 2010 was spent restlessly, hearing news of Commonwealth Games scam, 2G spectrum allocation scam and a hell lot of other big-ticket scandals. As such, the conscientious person that I was, I had left all jobs way back in December 2008 after I found my last employer neck-deep in corruption, but that is another story. About two years thereafter were spent in freelance jobs and intermittent talks with friends, new and old, on the state of the nation. None of us was sure what we could do to take our country out of the rot until 2011 arrived holding a lot of promise. 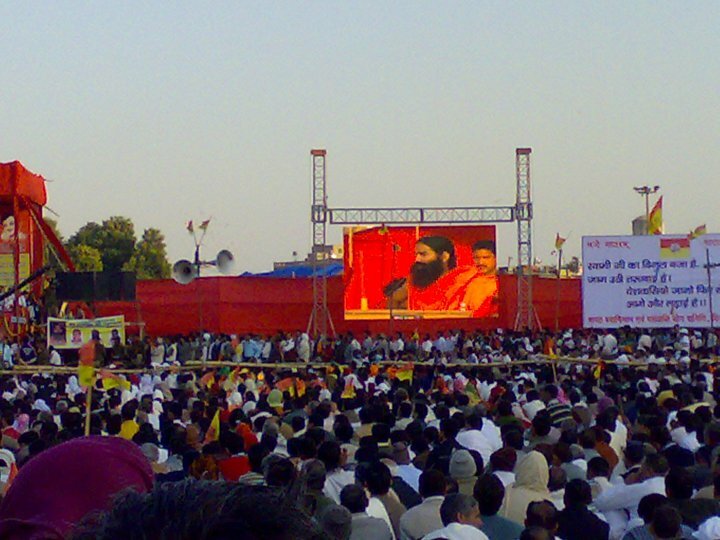 The first rabble-rouser on the national stage was Baba/Swami Ramdev. His was a much bigger name then than Anna Hazare’s, thanks to the propaganda — parts of which were credible, ignoring the hyperboles and ideological beliefs of swadeshi — he had been unleashing for about five years via a television channel his trust partially owns, Aastha. He appeared to have a massive following, a size that could intimidate any government. So he was the obvious choice for the gentries like ours that were itching for a revolution. It began with meetings in various parts of Delhi. 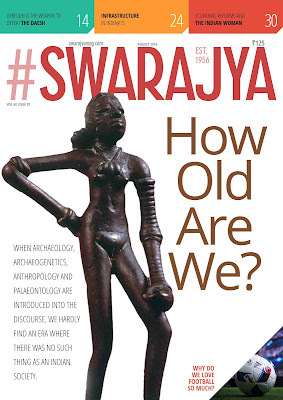 Soon we realised that the boys, drawn heavily from the Rashtriya Swayamsevak Sangh, though without the Sangh top brass’s permission (unlike what the ilk of Congressman Digvijaya Singh alleges), were constrained badly by lack of autonomy. Both Vikash and I would push them for a bigger movement in every meeting only to know that no such mandate was received from Hardwar. Being a sceptic, thanks to my stint in journalism, I did not join Bharat Swabhiman formally and preferred to observe it from a distance for a while. But my friend did. Vikash took up what they call a special membership (vishisht sadasyata) after duly filling a form billed at Rs 1,100. In the Arya Samaj temples that we visited thereon, we heard from all regional officials in-charge that the baba would come once in a while for strategic meets but would be surrounded only by his coterie of Jaideep Arya, SK Gupta alias Tijarawala and a few other monks of the Arya Samaj order all that while. In a few hours the meeting would wind up while the regional officials would be left wondering why no feedback and opinion was sought from them. It was perhaps out of the palpable frustration that emerged out of this inaccessibility of Ramdev that these officials started opening up to the world outside. They revealed to us that Bharat Swabhiman was a movement in a hurry. To spread fast, far and wide, they devised a strategy of making any filthy rich man the officer in-charge of the region he dwelt in. Rationale? They needed huge, reserved spaces in every village and city to organise meetings and mobilise people, and only the super-rich could provide that. Yet these rich men later excused themselves by pleading that their personal earnings or savings couldn’t be spent on furthering the organisation’s cause. As a solution, Hardwar offered that the medicines produced by Divya Pharmacy and the magazines published by the Patanjali Yogpeeth be sold by these regional satraps, the proceeds of which could be spent on the movement. Without adequate checks and balances in place, this became a recipe for rampant corruption. Enabled by dodgy bookkeeping, the greedy lot began swindling huge chunks from the sale proceeds of the drugs and books mentioned above to pump them into their respective businesses of paints, fuel stations, real estate, etc. To add to the profit margin, the distributors and retailers were further tampering with the seals of Divya Pharmacy-made drugs to adulterate them or at least dilute the contents. It must be clarified here that the organisation’s central leadership cannot be blamed wholly for this. Sanjeev Sabhlok need not have, therefore, clarified that the medicines, for example, were produced adhering to strict quality standards. Corruption was happening in the ranks below. It was perhaps not within the wherewithal of a bunch of holy men on top to keep a check on the whereabouts of the cadre. And the baba was so tightly cordoned off by his coterie all the while that even a slip of paper with some complaint registered in it could never reach the yoga guru without first being scrutinised by the likes of Arya. Yet murmurs of dissent as well as gossips of corruption finally reached Baba Ramdev. It was for this reason that, at the end of the 27 February 2011 rally at the Ramlila Grounds, he declared a postponement of the 23 March (day of Bhagat Singh’s martyrdom) Delhi gherao, previously planned, sine die. The baba had rightly feared that his planned rebellion would be met with serious retaliation from the government, and the establishment’s first target would be possible corruption by the very rebel. Officers from Gujarat to West Bengal, who were participating in the initiative with full honesty, told us the leader would use the interregnum to clean up the organisation. In between, the hugely successful hunger strike by Anna Hazare happened in the period 5-8 April that year. Vikash sulked for a while for the India against Corruption group not reciprocating with the magnanimity that was shown by the baba during the latter’s show on 27 February, where Anna, Arvind Kejriwal, Kiran Bedi et al were offered enough time on the stage, as IaC could accommodate BS’s leader only for a few minutes after which some television channel editors reportedly called up to remove the saffron-clad man from the stage as he was not ‘camera-friendly’ enough for their upmarket viewership. Since I was never a member of BS, I had no problem mingling with any crowd of crusaders. Besides, I was also drawing close to KN Govindacharya — a former RSS pracharak whom the media still links unduly with the BJP despite his categorical statements damning that former party of his as much as the Congress for the sorry state of affairs of the country — whose comprehension of politics was mesmerising to say the least. 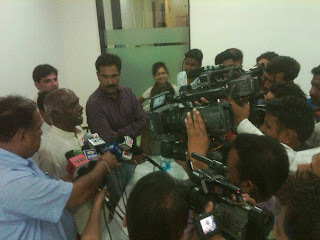 On 25 June 2011, we had formed Save Democracy Front, a composition of 50 organisations to fight corruption politically. Next month my friend and senior journalist Sudesh Verma, a firebrand youth leader Meena Dabas, child rights worker Rizwan Ali, educationist Shree Lekha Pillai Sahu, a few other social activists and I established Youth for Democracy (Y4D) to spread awareness about democracy among the people. Between 5 and 8 April, we suspected IaC was a safety valve devised by the ruling dispensation to let off the steam of the people’s anger, but its souring relationship with the Congress in course of the sittings of the joint draft committee turned it into a genuine revolutionary group. On the other hand, Baba Ramdev’s image suffered a serious setback following his ignominious exit from the stage on 4 June 2011. And when there was no uprising following his humiliation, our observation that BS couldn’t be relied upon, as the organisation suffered from a lack of successive lines of command, was vindicated. I joined IaC in October 2012 when Govindacharya was still not ready with his cadre to take on the might of the government, while all his ideas of vyavastha parivartan (systemic change) were being picked up one by one by IaC. All activists understood this was the platform, of all anti-corruption groups, most likely to succeed in politics. 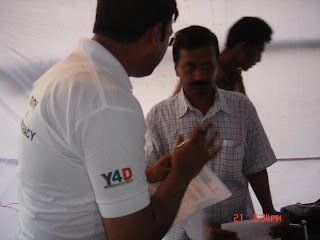 If it does, some day in future, we thought it should stay honest to its mandate, to ensure which I am a part of the Aam Aadmi Party launched by all prominent members of the erstwhile IaC group except Anna and Bedi on 24 November 2012 (publicly on the 26th). The mandate is to deal a heavy blow on corruption, irrespective of the means to achieve it. The thousands of largely urbane youth that poured into the streets following the call by Anna in April and August 2011 are not interested in regressive socialism of Indira Gandhi’s vintage. Further, if after raising a hue and cry over government’s corruption all powers are returned to that very government, it would be a betrayal of people’s trust. So the youth like me came in to make the movement stay on course. And we found to our sheer joy that the alternative system being proposed by the members of the National Executive of the AAP was indeed not hackneyed. It’s unfair to look at them as socialists (in the sense that this term typically conveys, notwithstanding the fact that all political parties registered with the Election Commission of India have to pledge on paper that they would be socialist). The whole AAP team now — with social justice champion Yogendra Yadav and free market advocates like Mayank Gandhi, Prithvi Reddy, me and many of the thinking minds that attend the party’s policy meetings alike — is pushing for a new era where civic amenities would be managed by gram sabhas (in villages) and mohalla sabhas (in cities); thrust would be on conservation of nature; natural resources would need community clearances to be exploited; health and education would be state priorities; competition would be allowed wherever competition is possible; secularism would be observed in the strictest sense, moving away from turn-by-turn communalism practised by the Congress/SP and the BJP; foreign policy will be determined by reciprocity, etc. Most importantly, laws can be made or rejected by the people using the tools of initiative and referendum; candidates in an election can be rejected with a NOTA (None of the Above) button on the electronic voting machines, and elected representatives can be recalled before their normal tenure of five years ends if they are found reneging on the promises they made during their respective electoral campaigns. This brings management of the country's affairs directly in the hands of the people, who will not be watching the proceedings of governance as mute spectators helplessly for five long years. I hope this is the course the Gandhian Kejriwal stays. And for information of all and sundry, once and for all, Gandhism is not (Indian) socialism. It’s a distinct school of thought. Jayaprakash Narayan, Ram Manohar Lohia et al and their followers thought otherwise because they were suffering from a hangover of Marxism which they grew up on during their formative years. The model I have just explained finds no place in Das Kapital. If the AAP assumes power and then imposes on the country a Pranab Mukherjee-style economic thought, massive disappointment and desertions will follow. As an insider, I’ll try not to let that happen. The second sentence was meant to be: Allegations of corruption in smaller measures by parts of the anti-corruption brigade helps the government. For an activist looking for a credible platform, the hint of corruption in Bharat Swabhiman was enough to bid it adieu. I am not a part of the government or a force inimical to BS that I must investigate further into the apparent scandals in the rank and file of the said organisation that surfaced in front of me. If what appeared obvious proves wrong, I’ll be happy as a patriot, as I believe Baba Ramdev is a patriot, too. Second, I must say you have a pre-determined dismissive attitude that does not help the cause. I went through your responses to Sarbajit Roy’s allegations as well. [I did not know till yesterday who he was. But my introduction to this blog of yours made me curious about him. So I went through the Wikipedia article about the character.] While his allegations are against a prominent face of our movement, and so I should be supporting your side of the debate, I am sorry to state that you fended him off in a shabby manner, with the same dismissive attitude that you have betrayed in my case. In your place, I would have argued in favour of Arvind Kejriwal much better. In this particular post, you have dubbed every charge I made as “hearsay” even though my descriptions show not all of them are so. Anyway, I repeat, even hearsay was enough for a new activist to stay away from your movement in fear of sullying one’s own image as well as, subsequently, having to defend the indefensible perhaps. Now I seek to respond to your ripostes one by one. The the letters in the italicised, highlighted font represent your words. I’d like to see his actual allegations, please. Can you ask him to publish his allegations? I see no evidence of such allegations on the internet. It is not obligatory that any movement work according to your plans. Sure! For me, it was enough to know that BS was anything but revolutionary in its thinking and approach. That did not suit my temperament because I did not believe — and still do not hold — that systemic change in governance could be brought about by protesting at a place in accordance with government sanctions in the form of police permissions. No revolution in the world has happened by adhering to the rules and limits set by the existing government of that land. This is heresay. It is inappropriate to use the word “coterie” – which has negative connotations. Here again, the issue seems to be that the some people wanted to provide feedback/opinions but were not heard. This is common issue with busy people. Arvind met me for a hectic and active 20 minute meeting, but then he entirely forgot it! I don’t hold that against him. What I hold against him is that despite many other communications, he has not bothered to pick a phone and get his ideas challenged. He seems to hide from debate. In such a case should I say his “coterie” is protecting him? I don’t think so. He may be busy. He may be opinionated and very foolish. But that doesn’t imply corruption or any “coterie”. Let’s not use strong words without evidence. “Hearsay” is a term associated with observations from distant people. These people were not distant; they were a part of the organisation in question. That was unlike your acquaintance with Arvind Kejriwal; you are not a part of IaC or the AAP. This is not a security cordon, mind you. The coterie is just apprehensive of some untoward information about them reaching Baba. This is hearsay. Have you verified even one such case, having been a journalist? Even if true – since you have not verified this it is impossible to confirm these statements – what you are pointing to is the fact that bad people managed to enter BST, and the management systems were perhaps weak. Let me assure you that I’m informed that some serious criminals have entered AAP. That’s a sign of serious mismanagement of AAP, but not a reflection on Arvind’s personal integrity. Trust we can agree on this basic principle? And what I am pointing to is not bad people managing to enter the organisation. It was the organisation’s blanket policy of making the filthy rich in-charges of various regions that ensured that checking the entrants’ antecedents was not in their scheme of things. For, if you did that, the spread of the movement would turn slow, which Baba wouldn’t like. Speed has always been his preference to accuracy. As for your 'information' about the AAP, it is laughable. You appear to be making an allegation out of frustration and a sense of retribution after going through my allegations about BS. First of all you are jumping to the conclusion that this is true . It is almost certainly false. As far as I can tell, any fraudulent people in the system are rapidly caught. Then investigate — if not catch — the officials who deal in paints, petrol pumps and real estate. Being an insider, you must know who I am referring to. I repeat, I am neither a government’s person nor a part of your organisation to perform this duty. If it were about my organisation, I would have spent time to unearth more. You are sounding like Pakistani representatives’ who respond to India’s allegations pertaining to the Kargil War, the 26/11 terrorist attacks and beheading of our soldiers. Further evidence is in your reach, not mine. Second, you are making the assumption that the central leadership/ “coterie” is at least partly responsible for this. Not quite. The coterie is not responsible only for letting corruption rule the roost in the lower ranks, but they appear corrupt themselves. They are equally involved in diverting the organisation’s funds to their respective businesses, as was alleged by both Vikash and Chugh. This may be true for the centralised accounting system that deals in money received by the organisation. It does not appear true for the expenditure part. And no auditor will catch you on the wrong foot for not knowing the further break-ups of your expenses, once the despatches of medicines and magazines are made. You can show the medicines and magazines as expenses; there is no need to show how the proceeds of sales of these by the cadre were utilised by them. But hold it! Do you by any chance mean that a case of corruption cleared by a chartered accountant is no corruption at all? If your answer is a ‘yes’, you are in good company; the BJP forwarded an equally specious logic while issuing a clean chit to Nitin Gadkari with a similar help from S Gurumurthy! Prove that the central leadership has CONNIVED in any fraud (of which you only have hearsay evidence), I don’t see why they are even partially responsible. In the part to which the above is your response, I meant that the leadership may not be responsible for inducing corruption into the cadre, but it is certainly responsible for putting in place an ineffective bookkeeping mechanism. Why do you undermine the management capacity of Ramdev and his team? I have seen work of international quality during my recent stay in Haridwar. Hardwar is not where the adulteration happens. It happens in the stores of shops across the country where the drugs are sent for retail. … have you any evidence that complaints are not being acted upon? So what happened? Assuming your statement is true, did the “clean up” take place? Were control systems strengthened? If so, is there any continuing concern? Their determination to reform India is, today, unsurpassed. I speak from personal observation. I’ll discuss these comments about AAP ideology separately. This is my last message in this sequence. I do not wish to malign Baba Ramdev in particular, much as I have no love lost for his coterie and cadre. If he can address the issues I have raised, it will help our motherland a great deal because his formidable following is indispensable in this era’s fight against corruption. Then Sabhlok comes up with this post. The owner of the blog whose link appears above is grossly misinformed about the Aam Aadmi Party, or is into a propaganda campaign to malign it. I explain how. His statements appear in italicised highlights and my responses to each of them follow, step-by-step. Neither Kejriwal nor AAP oppose government control over our life. On the contrary, Arvind Kejriwal has said in private and public platforms alike, time and again, that it is unfair for the Centre to decide how local affairs of every nook and corner of the country would be managed. As a result of this centralised decision-making process, essential services are denied to the people for long, and money reaches the local administrations as tied (qualified) funds. So you have situations like a defunct street bulb lying unattended for months and years because the corporation would care to fix not one light but the lamp posts of an entire stretch of road. We add to it that often when a village is inundated, the panchayats cannot carry out relief work and take preventive measures (like building embankments or trying to change the course of the river) despite money lying in their coffers because the money might have been despatched to them exclusively for, say, drought relief! Several democracies across the world allow local decision-making. In the film shown to our volunteers, which is a part of the speech delivered from the stage at Parliament Street on 26 November 2012, Kejriwal speaks of transferring such authority to local administration as it happens in Brazil, for example. There is no mention of defence of our liberty as the only reason for the existence of government. It is often, under Arvind Kejriwal’s model, possible for liberty to be crushed just because a local collectivist body (“gram sabha is not less of a state than a “big” government) decides to do so. Liberty is meaningless until the people offered this opportunity are educated and evolved enough to use it. Your point of view is that of an urban elite. If individual liberty is granted without preparing the ground for it, big sharks will gobble up the smaller fries. We are not against liberty; we are against unprepared liberty, which translates to liberty only for the privileged class, wherein the disadvantaged classes will keep wondering what or who pulled the rug from beneath their feet. We are for liberty at a time when intense competition is indeed possible. A small Jan Lokpal may be relevant at a certain stage in India’s development, but by missing the cause of corruption – socialism and the discretion embedded within government – Arvind merely wants yet another large government entity. An ombudsman of a state is necessarily a government body. It is ludicrous to denounce it while not stating clearly whether the alternative is the prying eyes of a private body. Does the blogger instead propose voyeurism by the likes of Internet-based businesses that spam our email accounts with advertisements after eavesdropping on our conversations over telephone or even those at home outside which their detective gadgets loiter about? It is not by stopping the 100s of unnecessary things India’s governments do, but by creating yet another – almost extra-constitutional mega-body with thousands of bureaucrats – that Arvind wants to solve India’s problems. That is a purely socialist approach. Let’s not be prisoners of isms. I am not debating with you in the capacity of a socialist or a capitalist. The AAP proposes things that will work, no matter what ideology a certain action is a part of. And you did not explain how an ombudsman is extra-constitutional. For your information, the Lokpal debate is of 1967 vintage. No political party or political commentator has so far levied the charge of extra-constitutionality on it so far. It is a maximalist approach that will do nothing to reduce corruption. Wrong premise! An ombudsman comes into force post-crime, not pre-crime. We are suggesting other mechanisms to prevent corruption. Wrong sub-heading! Yogendra Yadav is a socialist, not a communist. Economic equality, not equal opportunity. Bad distinction! Yadav has nowhere denied equal opportunity. But how does one ensure equality of opportunities when a minuscule section is domineering and the majority underprivileged? How do you expect a school drop-out from Bihar’s Begu Sarai to take on the might of those dwelling in Delhi’s Vasant Vihar or Mumbai’s Juhu? Let’s take a sample of less differences. How about an SEZ? Have you ever surveyed the businessmen of one? Did you know that the Blue Chip companies managed to reach the top because they are offered equipment in their factories at throwaway prices while smaller companies in the competition have to shell out a fortune to procure the same? Why stay in a country that doesn’t value you? – in a country where you are expected to be an “economic equal” of those without talent or capacity for hard work? Why stay in a country that insults your talent and hard work? I am no one's equal. I am unique. So are you. So is everyone. You have left the country already. Why bother about those not moneyed enough to set sail overseas? As such, your accusation is wholly presumptuous. You jump the gun every now and then. While India has a lot more to do to appreciate individual talent, in centres of excellence like the IITs, the joint entrance examinations push to the fore far more poorer candidates than they uphold the affluent. Where the country lacks is putting in place a regime that makes launching businesses easy, which would offer more competition to the cronies that influence government decisions. 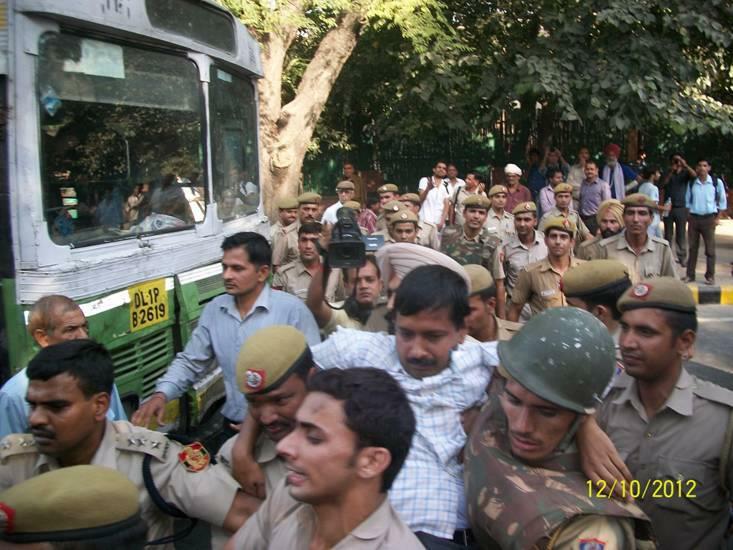 … the government will run schools and hospitals in Arvind’s world. That’s pretty much what happens now in socialist India, and has happened for 65 years. It is a total recipe for disaster – regardless of teacher appointments by the “community”. Instead, we need a system to deliver equal opportunity. We should get the government out of RUNNING any of these institutions but ensure that the poorest are able to access high quality education. Uneducated comments! One wonders how socialist India has been, with the likes of GD Goenka Public School, Delhi Public School, Amity, Apeejay, Lotus Valley, Heritage, etc ruling the roost while municipal schools get a raw deal. It is comparable to the transport sector where the authority connived with car manufacturers and deliberately neglected public transport, while abruptly ushering in an era of metro rails, monorails and bus rapid transit systems after the car makers told the government that their market was now saturated, with even lower middle class people earning as little as Rs 10,000 a month now owning cars! Wouldn’t metro and BRT have made more sense 15 or 20 years ago? Why were these poor people forced to invest in a commodity that constantly depreciates post-purchase when they could have invested the money spent on cars in their children’s better upbringing? The municipal schools will continue to be low in government’s list of priorities as the owners of private schools keep bribing it to keep their business brisk. The situation is, in fact, worse than that in the transport sector. For, unlike the market for cars, that for education will never saturate. Second, teachers have never been appointed or sacked by communities anywhere in India. They are all centrally managed, due to which teachers continue to draw regular salaries and other perks of the job despite poor performance of the students. It happens because the local folks, who witness the laxity in teachers’ duty day in and day out, have no say in the continuation of the teachers’ employment. Third, the last sentence of the paragraph betrays total ignorance of the recent development where private schools were taken to task by the government for denying candidates from the Economically Weaker Sections admission to their schools. In Sanjeev Sabhlok’s world of exclusively private schools then, how do the poor access education? Fourth, one wonders how, after all the recent (two decade-long) experience with private sector universities, one could repose faith in their competence. Would Sanjeev Sabhlok argue that cerificates from a Lovely Professional University or a Sharda University is more credible than that from a Delhi, Madras or Calcutta University? Your conclusions in parentheses are nothing but mischievous play with words, putting words in our mouth. That is not what Nehru and his daughter Indira did. They nationalised sectors where competition was possible: airlines, banks, etc, while privatising many where competition was not possible: basic amenities, natural resources, etc. Airports and airlines are not welfare sectors. Taxpayers’ money is uselessly drained in managing these loss-making ventures. I do not support their nationalisation. This must be Prashant Bhushan’s personal view. The party’s document on economic affairs will be published by April 2013. Your remarks about where our policies stand with respect to this sector are, therefore, wholly hypothetical. First, your language is uncouth. And yet you want to be taken seriously? Second, it seems by now you have forgotten the contents of Kejriwal’s book, Swaraj, which, in some of your previous posts, you claimed to have read. Is this how the book proposes the villages will be managed? Third, are you an advocate of mushrooming slums? What has the ‘liberty’ — I didn’t know a villager’s migration to a city was as pleasant an exercise as exercising a choice — of moving to a city offered to a villager? Only worse conditions of living: high cost, low income, living in shanties, being treated as subhumans by the police, etc. Why would you oppose rural job creation dictated by the culture and core competencies of the respective villages of the country? When a government should not even own the railways, Why should it own the airports? So, are you dreaming of dozens of — for the sake of competition — privately owned railway stations because you are not satisfied with the one in each city/town run by the government? Where will the stations be constructed? Up in the air? Even the air space of a country is not limitless. And then there is a fundamental difference in the nature of the two segments. Railways is largely used by the poor and the lower middle class for travel. Airways are accessible only to the upper middle class and the rich. If the Indian Railways is privatised, the passenger fares will rise to levels that cannot be afforded by the poor. It is a duty of the state to look after them. Or else, why have a state at all? The rail sector, too, could have witnessed reduction in fares through competition between private operators — like you have the no-frills airlines these days — but such a competition is simply impossible for the reasons given in the first paragraph. The AAP is against state capitalism. We advocate replacement of management by bureaucracy by community management and ownership. Your core team consists of 25 people and most of them are left-of-centre. I hope that answers your question. It's 23, and not 25. That was unfortunate and somewhat undemocratic, I concede. However, as the last paragraph of my first comment in your blog predicts, imposing personal ideologies of the National Executive members on the National Council and the supporter base of urban youth will be a mistake. People have flocked to our party in huge numbers, looking up to Kejriwal’s Gandhian ideals of fighting corruption by decentralisation and democratic ideas like referendum, initiative, right to reject and right to recall. 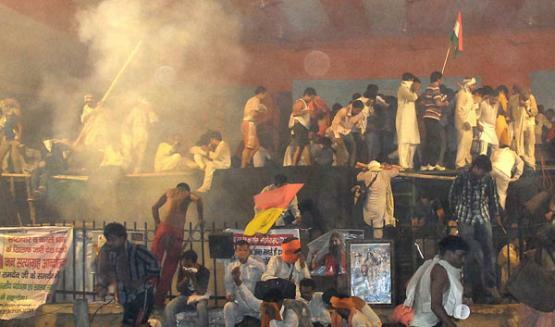 It is not the image of the ‘socialist’ NE members that pulled the crowds. They should keep that in mind while framing policies. On 26 November 2012 at his party launch, Arvind said: "If this tax is levied (from the corporations), then it will be possible to sell petrol at Rs 50 per litre and diesel at Rs 40 per litre." This message has been truncated mischievously to send across a wrong message to the readers. The whole context of Kejriwal was something like this: If the people were to decide what should be taxed and what should not be, would they tax the corporate sector or themselves? The current regime goes soft on the former and levies heavy taxes on petroleum products, thus almost doubling their retail prices. If the people take the decision on taxes, they will obviously want the taxes on petro-products to go, and this will drastically reduce the prices, thus having a cascading effect on prices of all the products that are high because their transportation costs are high. AAP doesn’t think that selling petrol is one area where competition should be allowed. The “IAS Brahmin” (like I was) is somehow best placed to fix the price. Why does India’s government have to set petrol or LPG prices? How come the prices in India go up when the international crude prices rise but do not follow the global trend when it goes down? Why should the government act as a broker between the petroleum companies and consumers? If the market is now really deregulated, as the government claims, how come we still pay taxes added to the prices at which the companies release their products to the retail outlets? Domestically produced crude oil costs the nation something around $55 per barrel and if the global price is taken to be around $150 per barrel, the average weighted domestic price comes to be around $122 per barrel. When converted to per litre, it costs the country about Rs 31 per litre. The refining and distribution costs included, the average cost of petroleum products like diesel and petrol should not be more than Rs 35 per litre, while the average rate of these commodities has been fixed higher… the petroleum products are the most taxed commodities in the country. If the government is so much concerned about the prices of the petroleum products, it must reduce the excise duty and the VAT rates across the country. But such a decision would result in loss of revenue. It looks like the loss to the oil companies is a myth created by the government to protect its own revenues. Complete canard! The only price other than those of petroleum products that the AAP says should be people-determined is Minimum Support Price for crops. One of the main reasons for large-scale farmer suicides is that the MSP offered to them does not even cover their production costs. If wheat is an essential commodity, then a farmer will want a HIGH price, the consumer a low price. So who will decide? And how? Is AAP ‘the people’? You are in a question-asking spree without adequate research. The farmer will never want an MSP so high that the consumer is disadvantaged. He is not only concerned about his poor living conditions but also sensitised to market realities. The APMC Act has to be revised or done away with. We are working on it. While personally I advocate removal of the seven layers of brokers between the farmer and the consumer, I will await the party’s final decision on the matter. I have sent my detailed article about foreign direct investment in retail to them. By the way, one of your favourite organisations, Bharat Swabhiman, is opposed to FDI in retail. If Arvind will kindly do me the courtesy of reading BFN we can discuss further. Because of your uncouth lingo, I am told by one of your fellow activists at FTI, Kejriwal had shot back at you, ‘Do you think you are the only wise economist around?’ Is this true? Sorry, I can’t tolerate socialists. They are the enemies of India. I’m sworn to destroy socialism. For the humongous damage it has done to my country. That makes it totally meaningless to engage with you in a debate. Because you want to learn nothing new. It is you who is a prisoner of an ism, not the AAP.